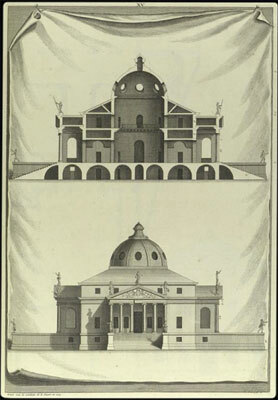 IN HIS SURVEY of Renaissance architecture, Architectural Principles in the Age of Humanism, Rudolf Wittkower uses the buildings of Leon Batista Alberti and Andrea Palladio to advance what has become an enormously influential argument about the relationship between a building’s plan, section, and proportion. 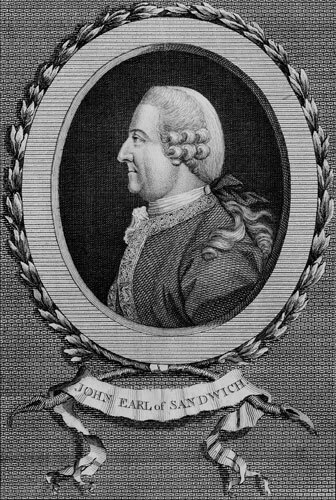 As it happens, it is also yet another argument for the enduring appeal of sandwiches. The argument goes something like this: in their celebrated religious buildings, and in divinely proportioned private commissions such as Palladio’s Villa Rotonda of 1567 (Fig. 1), Renaissance architects developed an idealized vision of architectural proportion. When experiencing such a perfect space first-hand, we are only dimly aware of its true qualities. In order to reveal such a building’s mysteries, we need to look at a very particular kind of architectural drawing, extensively deployed by Wittkower himself: the section. From the latin secare, or “to cut,” the section is a slice through a building or landscape. While such a slice can technically be in any direction, the word is most often used to refer to a vertical cut, allowing the building’s interior to be viewed from the side. When applied to a building like the Pantheon (a model for much of renaissance architecture,) or Villa Rotonda, the section reveals a precisely perfected layering of space and substance that was contained by what might seem to have been an overwhelming or inscrutable façade. The effect of the well-proportioned renaissance interior recalls the philosophical musings of Mircea Eliade, Romanian philosopher and author of The Sacred and the Profane: The Nature of Religion. (1) In this influential text, Eliade argues the architectural quality of these two spiritual conditions. (Profane, not incidentally, comes from the latin pro-fane, or “outside the temple.”) Eliade contrasts our daily movements around the world in plan (from planum, or the bottom of the foot) with the sectional quality of sacred space, in which we are taken out of this mundane reality into a vertical realm of divine harmony — not incidentally the sectional harmony of sacred space found from temple to mosque to chapel. And what does this have to do with the sandwich? Atypically, we can find the truth in marketing. When you enter any latter-day temple of the sandwich — from a Venetian sandwich bar to the upmarket Pret A Manger in London or New York — you gaze on a revealing prospect. That is to say, an array of sandwiches (tramezzini in Venice, Fig 2), laboriously assembled from a variety of everyday ingredients, centered on bread, and then sliced, diagonally, to best reveal these contents in all their enticing proportions. As Alberti wrote of the perfect church, the perfect sandwich is “the noblest ornament of a city and its beauty … surpasses imagination.”(2) The more holy the temple of the sandwich — at Katz’s Deli in New York or Louis’ Lunch in New Haven — the more likely these interior proportions will depart from the humdrum plan-based rectangle of their supporting bread to present a rounded, divine section. 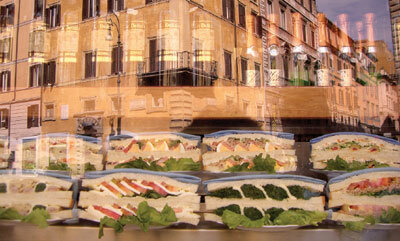 That the secret truth of the sandwich is revealed on its sectioning would surprise nobody less than a sandwich gourmet. Alberti’s reflection on perfect proportion in building equally applies to the perfect sandwich, which will “awaken sublime sensations … in such a way that every part has its absolutely fixed size … and nothing could be added or taken away without destroying the harmony of the whole.” (3) And it is only through the cut that this mystery is revealed. While the sandwich is thought to be at least a century younger than the Renaissance church, its combination of flavor and economy has ensured that it survives into modern life in a way that sectionally proportioned sacred spaces have not. Recent architectural examples reveal, however, that elegant sectional maneuvers are not lost on contemporary practitioners — especially those that derive their inspiration from the sandwich itself. Fig. 1: Andrea Palladio, (1508-1580) I quattro libri dell’architettura. Volume 1, book 2, plate xv: (London edition, 1715) Villa Rotonda. Fig. 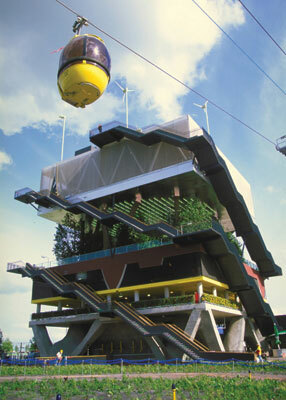 3: Mvrdv, Dutch Pavilion, Hannover Expo 2000. Fig. 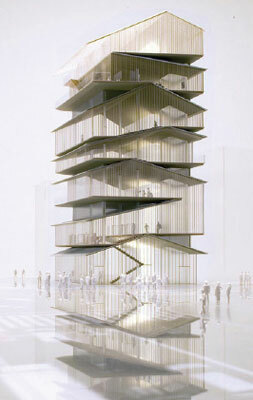 4: Kengo Kuma, Asakusa Tourist Information Center, Tokyo, 2009. 1. Mircea Eliade, The Sacred and the Profane; The Nature of Religion (New York: harcourt, Brace, 1959). 2. Rudolf Wittkower, Architectural Principles in the Age of Humanism, Studies of the Warburg institute, v. 19 (London: Warburg institute, University of London, 1949), 6. NICHOLAS DE MONCHAUX is assistant professor of architecture and urban design at UC Berkeley. His work has been published in the New York Times, the New York Times Magazine, Architectural Design (AD), and Meatpaper. He is the author of Spacesuit: Fashioning Apollo, from MIT Press. IT WAS SIX YEARS AGO, but I still clearly remember the first time I tasted banh mi, the internationally popular Vietnamese sandwich. My cousin and I had bought the pork-liver pâté filling from a market in Ho Chi Minh City. When she handed me the little plastic bag filled with brownish paste, I was surprised at how warm it was as I held it in the cup of my hand. At home, we slathered the thick, fatty spread onto fresh bread, and voilà — it was the best breakfast i had ever bitten into. This was banh mi (pronounced “bun may”) in its original form — a sandwich derived from French- influenced ingredients, a relic from colonial times in Vietnam. Its simplicity recalls skinny Parisian sandwiches with nothing but butter and sometimes ham. But unlike its denser French counterpart, banh mi — which refers to both the bread and the sandwich — is about half the length and usually made with a mixture of wheat and rice flours, giving it a light, crackly crust and an airy crumb. To the basic bread and pâté, mayonnaise was added, another French-inspired touch. At our home, making mayo was a family affair, with one person slowly dripping oil over a bowl while the rest of us took turns frantically stirring the egg yolk with a pair of chopsticks, beating the orange goo slowly into a creamy lemon-yellow spread that my sister and I licked up with our fingers. Banh mi shops must have a more efficient process, but the best ones still make their mayo in-house with fresh eggs. In Saigon, the basic sandwich got jazzed up, with a variety of fillings ranging from eggs fried sunny-side up (op la) for breakfast to heartier Vietnamese meats, including grilled pork (thit nuong), grilled chicken (ga nuong), meatballs (xiu mai), and shredded pork skin (bi). The version that’s become most popular is “the special” (banh mi dac biet, also known as banh mi thit nguoi), layered with thinly sliced Vietnamese cold cuts such as pork roll, ham, and headcheese encased in pig skin. To offset all the rich spreads and salty meats, cooks add julienned strips of carrot and daikon radish pickled to a tangy sour-sweet perfection. and what is Vietnamese food without fresh herbs and vegetables? The meats are topped with a couple of sprigs of cilantro, along with a spear of cucumber and a few slices of chili pepper or jalapeño. The finishing touch is a dash of the Swiss seasoning sauce known as Maggi, though in a pinch, soy sauce can also work. In the United States, banh mi has long been popular in Vietnamese enclaves in southern California’s San Gabriel Valley, as well as Houston, Texas. 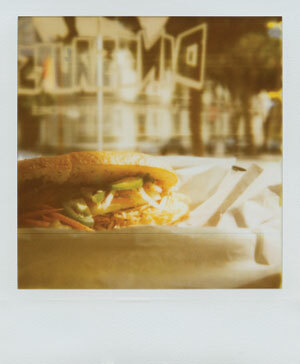 At the chain Banh Mi Che Cali, the sandwich is sold at an ongoing buy-two-get-one-free deal. Old-timers who recall when banh mi used to cost $1 still gripe about the whopping $2.50 price tag now attached to the sandwich. During recent years, the banh mi craze has spread to the rest of the United States, and the sandwich has attracted a cult following from coast to coast. Because who wouldn’t love the banh mi’s mash-up of Eastern and Western influences; its melding of sour, sweet, salty, and spicy flavors; its satisfyingly creamy, crunchy, and crispy textures, all packed into one bite? In New Orleans it’s been affectionately dubbed the “Vietnamese po boy”; in Philly, the “Vietnamese hoagie”; and in other places, the “Saigon sub.” Food trucks like Nom Nom in Los Angeles and Rebel Heroes in Northern Virginia bring the sandwich to the people, announcing their locations each day via twitter. 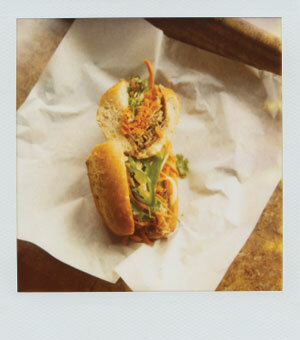 In New York City, where everything gets a makeover, the banh mi has been reinvented into a hip urban sandwich. Though down-to-earth favorites like Banh Mi Saigon Bakery in Chinatown are still popular, trendy delis and cafés with catchy slogans and clever designs have popped up all over the city. 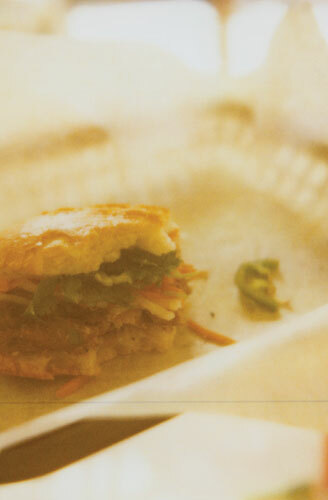 Xie Xie in Hell’s Kitchen sells a sandwich inspired by cha ca Hanoi, a dish of turmeric fish and dill. Baogette, which has three locations in Manhattan, serves a Sloppy Bao that includes spicy curry beef and green mango. Williamsburg is a hive of hip banh mi joints in itself, home to Nha Toi, where you can get a banh mi pho inspired by Vietnam’s classic beef noodle soup, and Northeast Kingdom, where the Bushwick banh mi includes pig’s head and foie gras mousse. 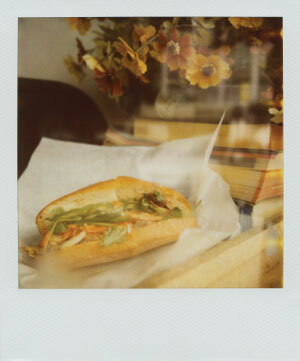 JULIE WAN is a DC-based freelance writer who is not afraid to travel far for a good meal. She writes a food blog at meatlovessalt.com, which archives recipes and stories from her Chinese-Vietnamese family. CHLOE AFTEL splits her time between Los Angeles and San Francisco. You can see more of her work at chloeaftel.com. And then the question that comes to everyone’s mind: Sandwiches? The Radiohead song “Talk Show Host” was released as a B-side for “Street Spirit: Fade Out” in 1996. It never appeared on a proper album but garnered a huge cult following when its haunting minor chord melody became Romeo’s theme in Baz Luhrman’s Romeo + Juliet. Like any genre, music journalism has its conventions and taboos. For me, learning to write about music for money meant forgetting how I heard pop music as a teenager. The first three cassettes I bought, at age 12, were NWA’s Straight Outta Compton, Ace of Base’s The Sign, and Meat Loaf’s Bat Out of Hell II. I learned never to admit this. I learned to bracket my enthusiasm, flaunt specialized knowledge, and, above all, not appear to obsess over the lyrics. Radiohead has never spoken publicly about the sandwiches in “Talk Show Host.” They declined to talk to us about it, on the grounds that they don’t talk to hardly anyone anymore. But if Radiohead doesn’t have any theories to share, the Internet hive mind has them in abundance. Alongside all the professional chatter about pop music online, there is another, much larger conversation going on. It’s a conversation taking place in the comments sections of all those lyrics sites that pop up whenever you search for a song. There, people are talking about what songs mean. And in the case of “Talk Show Host,” what those sandwiches mean. 1. The “gun and sandwiches” is, in my opinion, referring to the preparation one must undergo in order to be in the position of celebrity status. Gavrilo Princip who assassinated Ferdinand missed on the first go so he wandered off to buy a sandwich. When he came out, with his GUN AND HIS SANDWICH it just so happened Ferdinand was passing by and he shot him. 5. Sandwiches are casual. If you were shaking-in-your-boots scared of facing something/someone, would you be eating a sandwich? No. You couldn’t stomach it because of nerves. Maybe the guy is either fearless or hardened. Just musing. 6. I actually thought this song was about a talk show host in the 60’s who was losing his job and his wife left him and everything and he went nuts one night and locked himself in the stage room and held hostages and stuff. 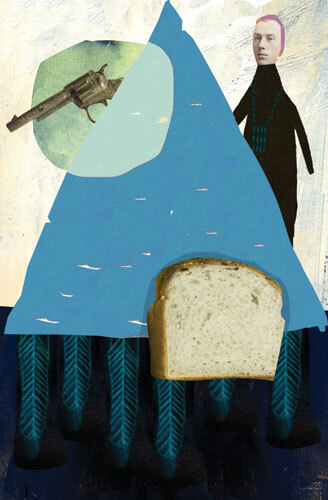 The only thing he had was the gun, sandwiches, and everything else had been taken away from him. The cops ran in and killed him, but this song is like a sympathy for the devil situation. 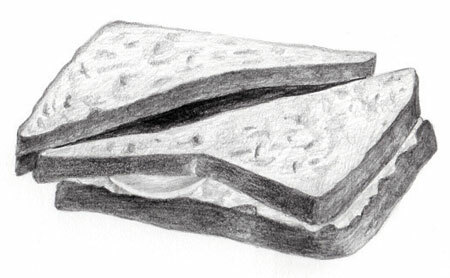 7. i always think of the sandwiches as pb&j’s … specifically chunky peanut butter and black raspberry jam … and then i get hungry. 8. A guy with some kind of sociophobia have nothing to offer but expects some girl starts to love him. He’s locked in his room, sad and introspective… He ain’t beautiful, rich or whatever… Females look for the strongest males in the animal world cause they want to feel safe and have access to food. This still a hidden instinctive characteristic of women. So the guy feels weak and all he can offer is the gun (security) and the pack of sandwiches (food). In other words, he is a complete freak and the only way he could gets into a relationship is to have a woman “breaking his door down”. 9. “I’ll be waiting/ With a gun and a pack of sandwiches” All of us live in a world outside of nature through our own technological defenses such as a gun, and supplies to survive while waiting– sandwiches in this case. 10. This song is about eating sandwiches sexily, obviously. TONY WARNER was the editor of Boldtype from 2005 to 2010. He has also written for the San Francisco Chronicle, Flavorpill, the Columbia Journalism Review, and ArtistDirect. He is a lifelong sandwich enthusiast; guns, not so much. 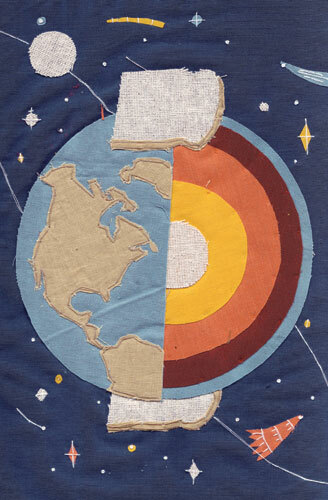 KATHERINE STREETER lives in New York City, where she works on mixed-media collage painting and vintage-fabric-wrapped dolls. She has been published and exhibited internationally and is currently working on a book of collected pieces. You can see more of her work at katherinestreeter.com.